Bangalore: Wipro Ltd’s information technology (IT) business beat its own forecast for revenue growth in the three months ended September, but analysts are doubtful if a turnaround has indeed taken hold at India’s third largest computer services provider after a management revamp. The Bangalore-based company’s IT unit earned $1.47 billion (Rs7,188 crore today) in revenue during the fiscal’s second quarter, an increase of 4.6% sequentially and 18% year-on-year. For the December quarter, IT services revenue is expected to be in the range of $1.5-1.53 billion, a rise of 2-4% on a sequential basis, it said on Monday. “After many quarters of under-performance, the company is showing the first signs of getting back on the track," said Pralay Kumar Das, an analyst at Mumbai-based Elara Securities. “The guidance for this quarter is reasonably aggressive. I was expecting at most a 3% growth at the top end." Not all analysts are as sanguine. Abhishek Shindadkar, an analyst at ICICI Securities Ltd, said a dip in offshore realizations was a concern, and while revenue has grown, one quarter is not enough to say Wipro was back on track. “Organic volumes grew by 4.6%, but offshore realizations were sharply lower by about 4% quarter-on-quarter," said Karan Dutt, an analyst at Kotak Securities Ltd. “This is the second successive quarter of fall in realization. While the management has indicated that this is temporary, this is of concern." Wipro’s stock rose as much as 3% as investors were enthused by the earnings, but ended 1.7% lower at Rs366.45 on a day the BSE Sensex fell 0.56% to 17,705.01 points. In February, the company replaced the joint chief executives of the IT business, Girish Paranjpe and Suresh Vaswani, and named T.K. Kurien as its new head. The IT business accounts for almost three-quarters of revenue at Wipro, which has underperformed bigger rivals Tata Consultancy Services Ltd (TCS) and Infosys Ltd recently. Kurien credited the strong focus on execution as being responsible for the return to growth rather than the restructuring. 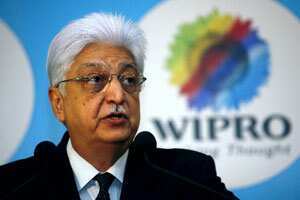 “We are looking at a sustainable future for Wipro. Don’t look at us quarter to quarter, whether the numbers are good or bad," he said. Second quarter net profit for the company—on total revenue of $1.85 billion, including other businesses such as lighting, consumer products and infrastructure engineering— was $265 million, an increase of 1% year-on-year. Volume growth came in at 6%. Excluding revenue from the $150 million acquisition of Science Applications International Corp.’s (SAIC) oil and gas IT business earlier this year, volume growth was 4.6%. Operating margins declined to 20% from 22%. But the management attributed this to a wage increase (an impact of 1.5%) and the lower margins associated with SAIC’s upstream (generation) oil and gas business (impact of 0.5%). The SAIC business had margins in the low single digits, said Kurien. But he pointed to industry estimates of $1.5 trillion being spent in the upstream oil and gas business over the next 10 years, saying the potential for revenue growth was sizeable. Still, the narrowing of margins has raised questions about Wipro’s future strategy on the trade-off between growth and margins. While Kurien was emphatic about not going into really low margin territory in the range of 14%, he declined to comment on just which margin band he would be comfortable with, preferring to emphasize the value offered to clients. Cognizant Technology Solutions Corp., for example, which overtook Wipro in quarterly revenue in the fiscal first quarter, has an explicit strategy of operating in the 19-20% margin range. Infosys and TCS operate at 26-28%. IT services operating income saw a 3% decline sequentially, but a growth of 7% year-on-year, said chief financial officer (IT services) Jatin Dalal. Going into the third quarter, there might be margin headwinds due to currency volatility as well as seasonal softness in terms of a lower number of billing days, he said. “Margins will remain volatile." While there is pressure on offshore pricing, sticker prices are not coming down, Kurien said. But the quality of projects is changing, with clients looking for quick turnaround projects that directly add to their revenue, he said.